California has just experienced the driest year since measurement of rainfall began, and Governor Jerry Brown has declared the situation to be an official emergency. Southern California is the driest part of the state, with the Los Angeles region averaging just enough rainfall over time to avoid being classified as a desert. Receiving an annual average of about 15 inches of rain, this total can be quite deceiving. Like any average, it takes into account the highs and lows, and like any average, can be skewed by the extremes. For southern California, the amount of rain that falls in a given year is almost never anywhere near 15 inches. Instead, southern California experiences periods of almost no rain alternating with periods of exceptionally high rainfall. It's a real boom or bust system. This is largely a result of our Mediterranean climate (cool, wet winters, and hot dry summers) to which the native plant communities have adapted. In part this adaption takes into account the wildfires that are part of the climate and landscape. In May of 2013 over 24,000 acres (over 9800 hectares) in an area near Point Mugu on the coast burned in a wildfire. Part of the destruction included Big Sycamore Canyon which leads up from the coast near Point Mugu to the foot of Boney Mountain in the Santa Monica Mountains range. In normal years, rains would have kick-started the recovery of the plant community, but as this last year has been anything but normal, the area largely remains a charred landscape. 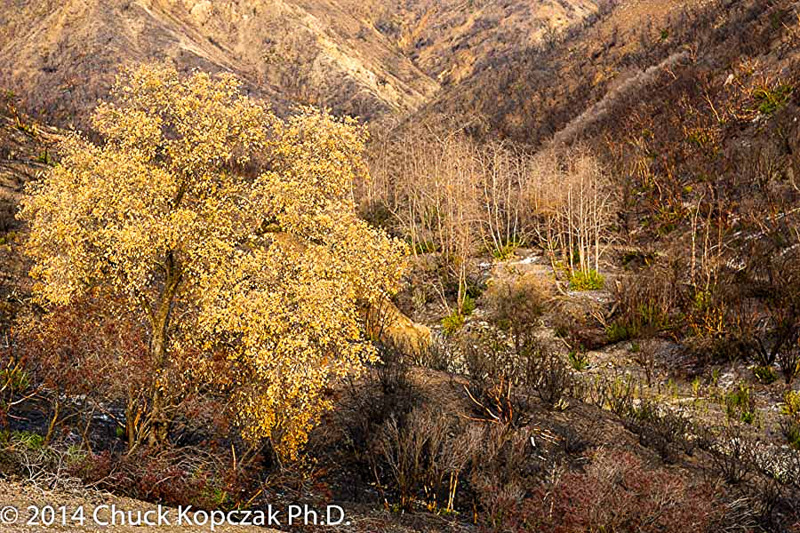 While our native plants like the oak tree and Sycamores seen in today's photo are hardy and respond well after fires, they can't grow in the virtual absence of any water. And these are the conditions that we've experienced in southern California over the last couple of years. As I said above, periods of excessive and inadequate rainfall are the norm in southern California, but what if conditions are changing to favor one over the other? What will happen to the plant communities, and the animals that depend on them, humans included? To what extent are these changes in patterns the result of the slow, steady accumulation of factors that is climate change? As climate is the extremely long-term average of day-to-day weather, it is not really possible to point to a single event as being the result of climate change, but we can ask if the conditions we are seeing are going to become the new normal for southern California. Will we see more and more prolonged periods of extremely dry years, and fewer and fewer periods of extremely wet conditions? Will the Pacific Decadal Oscillation tend to stick in a particular state more stubbornly, becoming, perhaps, the Pacific Centennial Oscillation? Research published January 19 in the journal Nature Climate Change warns that climate change will cause a dramatic increase in El Nino weather events during the 21st century. The big question is what we can do, if anything, to moderate the impact, or at worst, simply adapt to it. Climate change is a natural process, but evidence is mounting that this particular cycle is unusual because we seem to be a contribution cause to it. If that is the case, and if it seems clear that the outcome may be devastating, then don't we have a moral duty to act to protect future generations that have had no direct hand in creating these conditions? As a grandparent, I worry about the world that my grandchildren are going to inherit. have we contributed to the creation of conditions that may make life much for difficult for them? Can human ingenuity and creativity develop solutions to prevent the worst case scenario from occurring? I don't have answers to these questions, and I know that this is a controversial topic, but I believe it is one we must take seriously. Today's photo was taken with a Canon EF 85mm f/1.2 L lens on a Canon 5D Mk III. Exposure was set to 1/180 sec at f/5.6 and ISO 1600.